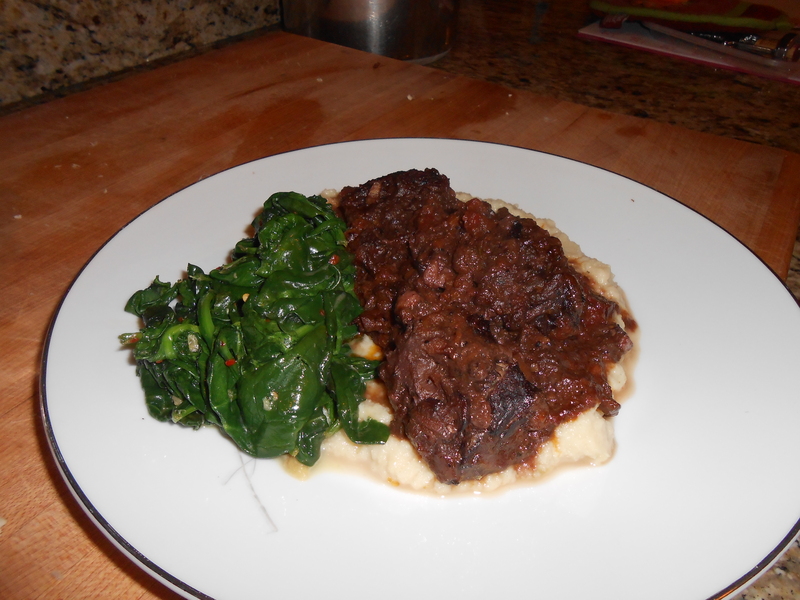 This pile of food is actually a freshly made cauliflower puree topped with red-wine braised beef (leftover! I got it out of the freezer. 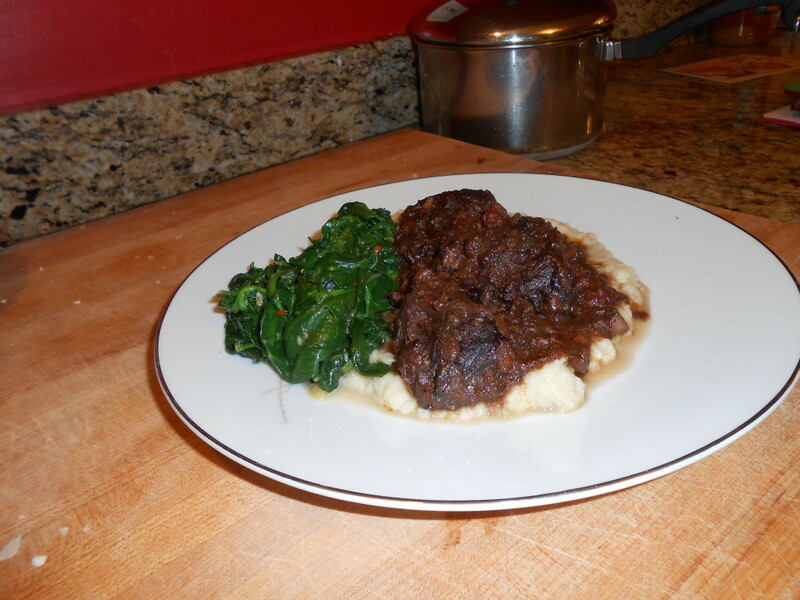 This one is a Mario Batali recipe- but feel free to use whatever yummy braise you want on top of your puree! 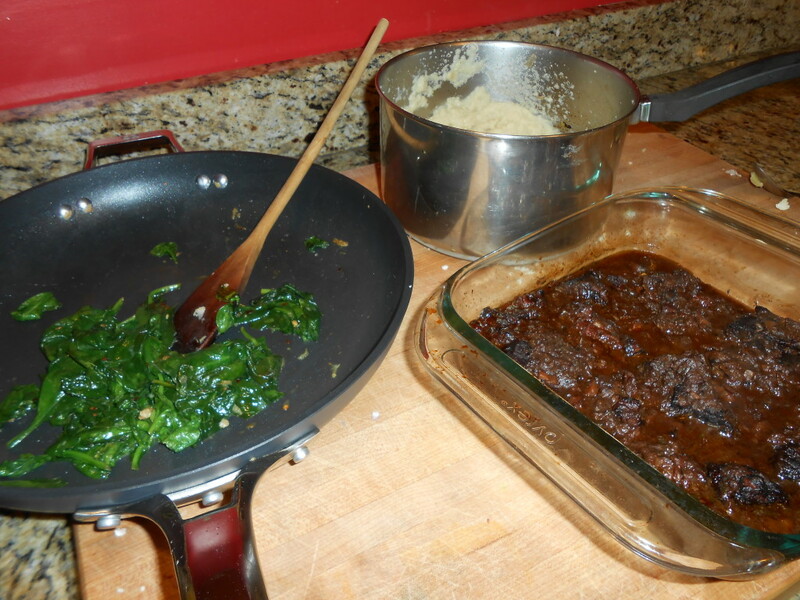 )- and some sauteed spinach (garlic, olive oil, red pepper flakes, salt) on the side. For the cauliflower- I made a small portion- enough for 2 people or 1 very hungry person- so scale depending on how many you want to feed. This is a paleo/gluten free/dairy-free recipe- so do know that you need to make sure that you salt it enough, and that you don’t add too much liquid. Ingredients: 1/2 a head of cauliflower, 2 cloves of garlic, 1 shallot, 1 tablespoon of olive oil, pinch salt and pepper (not pictured) Rough chop everything. We are making a puree- don’t labor over it. Shallots, garlic, and oil into a hot sauce pan over medium-high heat. Easy! Let them get slightly golden- lots of toasty flavor in there! 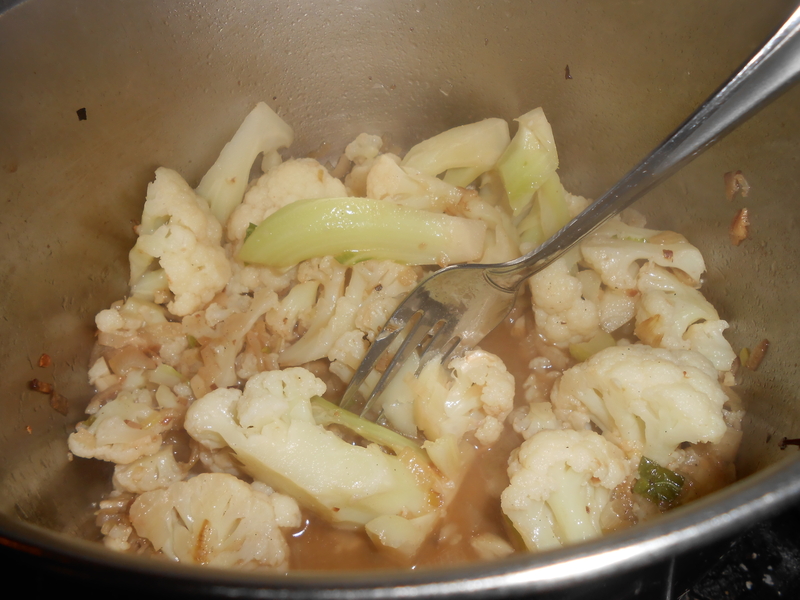 Add the cauliflower and saute with the garlic and shallots a few minutes, until it gets lightly golden, too. 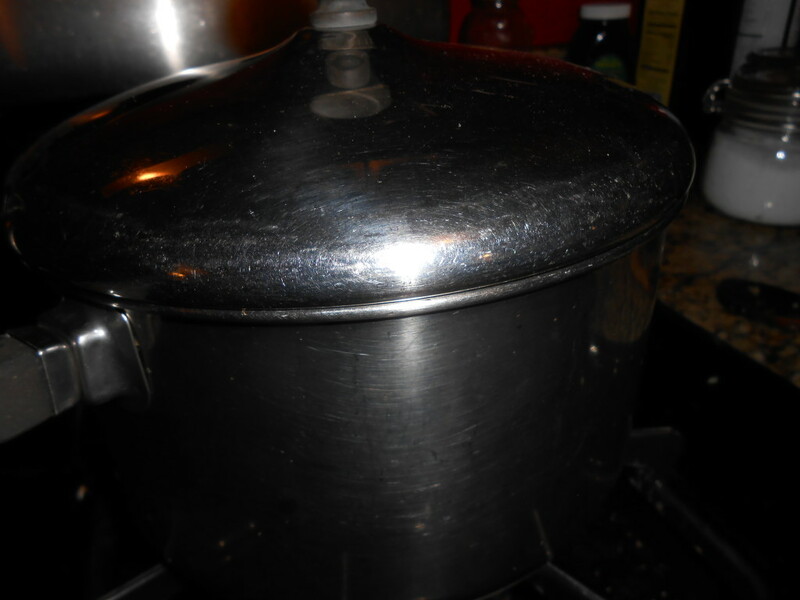 Then add about 3/4 cup of plain old water- scrape around for any browned bits, bring it up to a bubble, and cover. 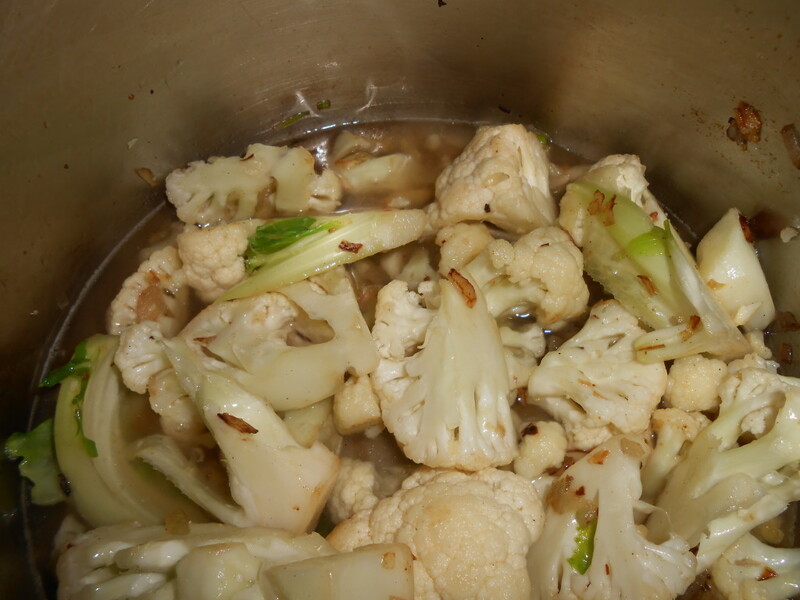 Cook/steam until the cauliflower is super tender. 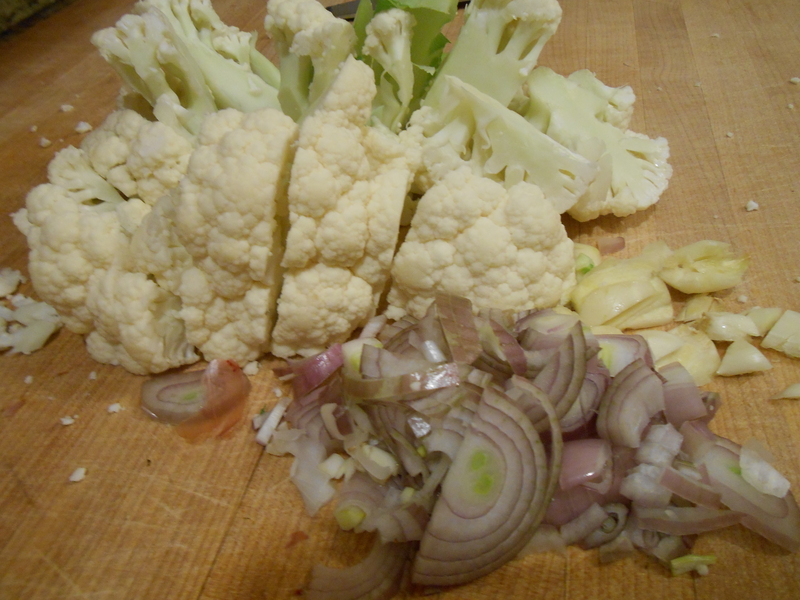 Test the cauliflower with a fork- if the fork slides in easily, it is done. Look how nice and brown the water is from all of the yumminess! It is all staying in this pot. 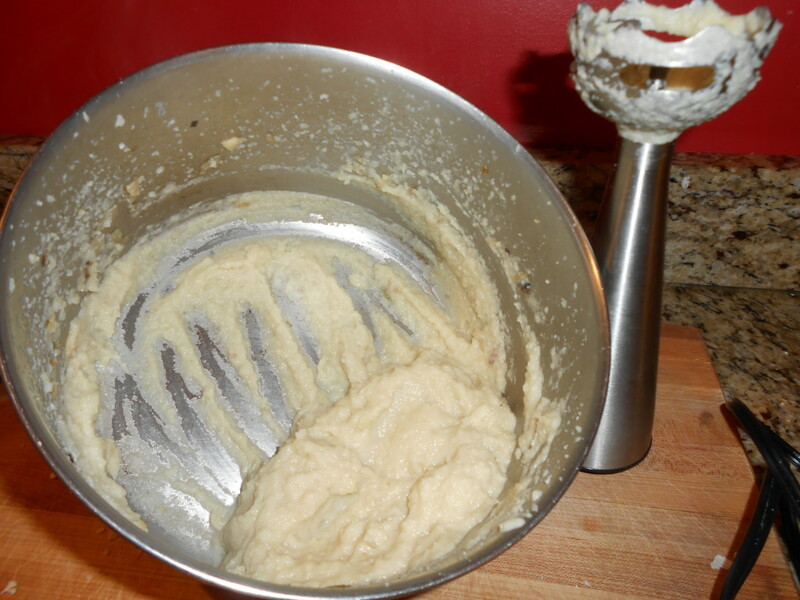 Next, using your stick blender or a food processor, blend until smooth. I think it would have been easier if I used a food processor- but I used the stick blender. Lots of manipulation to get it blended since it was a small volume of stuff. Lesson learned. Taste again for salt and pepper. I decided to leave mine slightly less salty, since I tasted my other components and I felt they had more than enough salt. A paleo, gluten free, dairy free puree that can be enhanced by any flavor profile you wish. An excellent vehicle for a braise or as a side dish to a grilled meat. 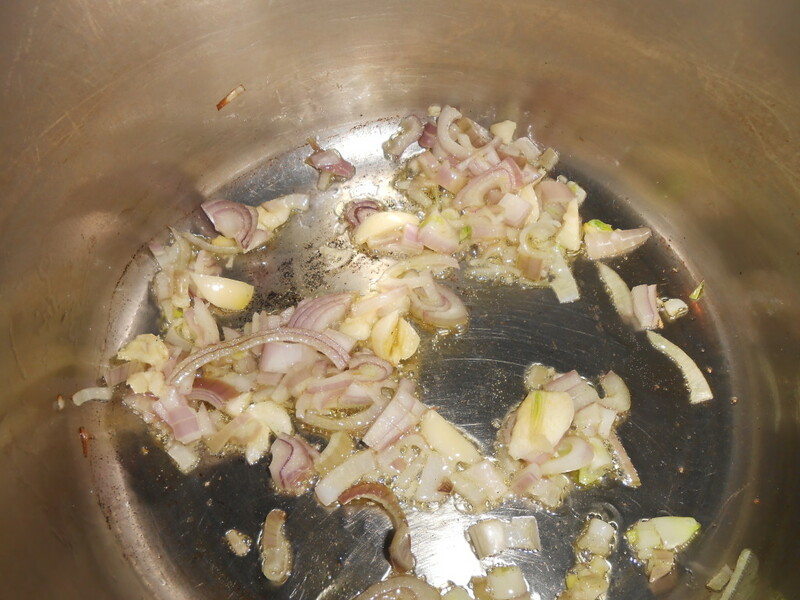 Saute the garlic and shallot in the olive oil in a medium sauce pan over medium-high heat until lightly brown and soft. Add the cauliflower, and cook until lightly browned. Add the water, and a healthy pinch of salt, scraping up any brown bits. Bring to a bubble and then cover. Cook, covered about 15-20 minutes until fork tender. Blend, or food process until smooth. Taste for salt and pepper. Note- this can be flavored with any number of additions- curry, mustard, truffle, cheese, etc. Experiment! 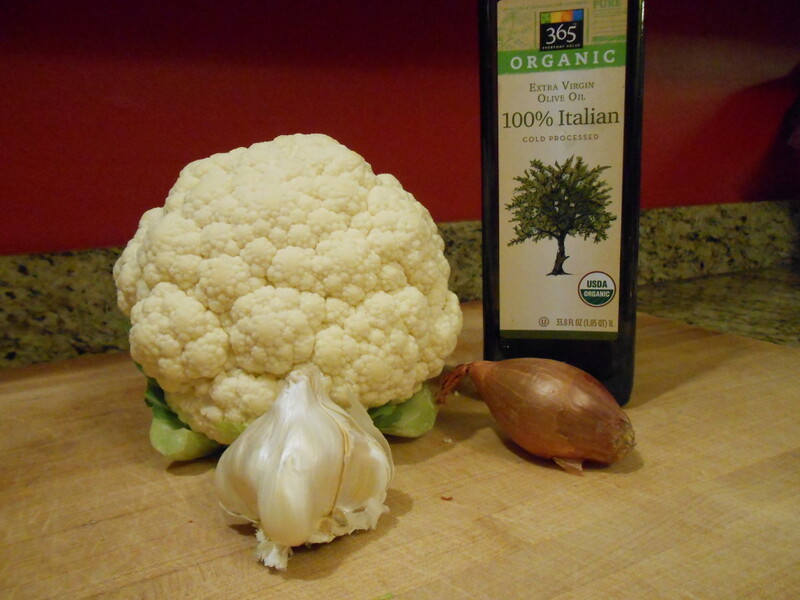 This entry was posted in Cooking, Recipes and tagged cauliflower, easy, paleo, puree, side dish. Bookmark the permalink.